Taking unique gifts and souvenirs home that you can only buy in London will remind you of your trip in years to come. There are several beautiful, nice and even yummy things you can buy in London, although the yummy ones won’t last long! I have put together a list that covers a wide range of gifts with prices to suit all budgets. 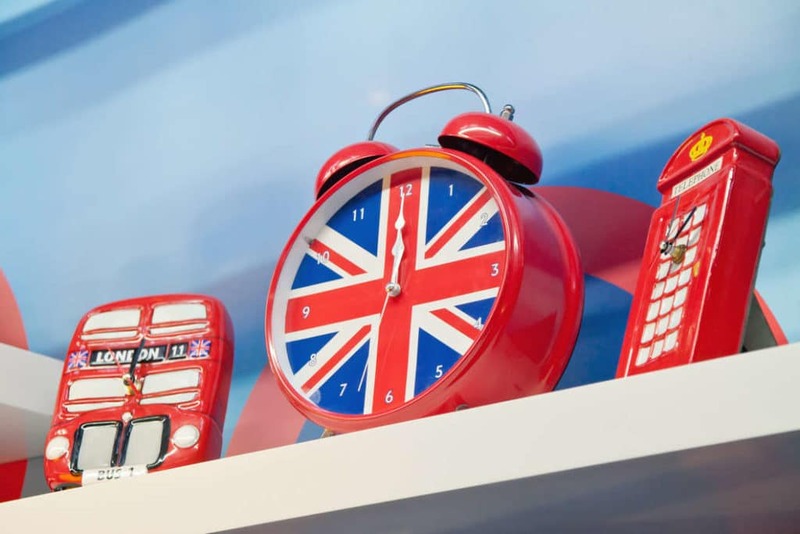 Here’s a list of the top London Gifts and Souvenirs! England is famous for its constant drizzle and grey weather so there is no surprise there is a shop dedicated to umbrellas. 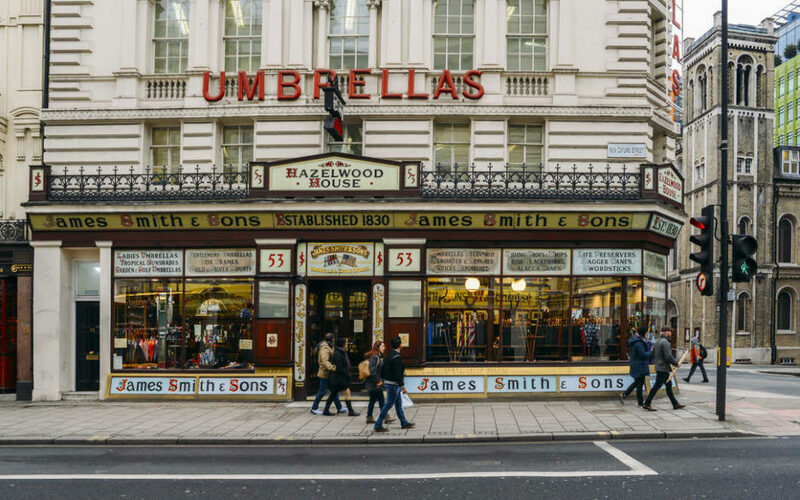 James Smith & Sons have been selling umbrellas since 1830, located in an original Victorian shop near Tottenham Court Road and Holborn tube stations. What better way to keep yourself dry than an iconic London umbrella? They still use traditional methods to create these long-lasting umbrellas. My pick for women is: The Morris & Co Minor Lily Birdcage. My pick for men is: London Umbrella with Redwood Crook. Fortnum & Mason has played a big part in London’s history, opened in 1705 selling Queen Anne’s half used candle wax for a profit. Later turned into a grocery store then they introduced their famous hampers. As the hampers can be quite big, bringing one of these home will depend on how much luggage space you have or delectable treat you choose. The Excellent Breakfast Gift Box makes the perfect hamper to take home. The English love their tea and there is no better classic souvenir than this. Whittard and Twinings are the brands I would recommend. The shops can be found around London and are a great thing to buy when you are in London. It’s lightweight and easy to pack in that luggage. For those who don’t like tea, Whittard also has incredible hot chocolate! 4. Pick Up Some Biscuits to Go with Your Tea! Head to one of the supermarkets like Tesco, Sainsbury, Marks and Spencer and Waitrose which will have plenty of these biscuits in stock. Chances are you are going to end up buying one of these whilst you are in London! It’s a great souvenir as they are iconic to London and who knows how long they are going to last with contactless now being used more widely. Go to the Visit Britain shop to pick up a visitor’s Oyster Card or you can just pick up one when you arrive in London. At the Houses of Parliament shop, you can buy branded items with the UK Government stamp. As someone that loves trying to create bullet journals, this is a super cool souvenir! You can buy these online, however, there is a big chance that you will stop by Big Ben while visiting London. 7. A Hat from Lock & Co. Lock & Co is the oldest hat shop in the world and with that surrounded in history. It is said that Lewis Carroll was inspired by the shop’s manager to create the memorable Mad Hatter character. Heading to Paris after London then you should buy a stylish beret from Lock & Co. On a budget, the canvas bag or lock keyring is a perfect London souvenir. Head to Kings Cross Station to platform 9 ¾ and you will magically be taken through the barriers to the Hogwarts express. Make your way into Olivanders to choose your wand or walk down the hallways and pick up some school uniforms. Primark is another good spot to pick up Potter merchandise at a cheaper price. I picked up this Ron Christmas jumper for £12 last year. Have extra time in London? Look at visiting Harry Potter Studio where you can pick up as many HP souvenirs as your heart desires. Cath Kidston is a quintessentially British lifestyle brand, their iconic prints are now available in 16+ countries but buying it in London just makes it that more authentic. I love their unique, colourful and witty prints. Cath Kidston has some cute luggage accessories my favourite pick is this luggage tag. Add a bit of British flair to your living spaces by getting a Union Jack decorative pillow. Buckingham Palace has an official gift shop offering a massive range of palace gifts. You can even pick up Cuddly Corgi which is an animal most famously associated with Her Majesty The Queen and their favourite breed of dog in the Royal Family since 1933. When you arrive in London you will hear the tube lady constantly say “mind the gap” between the platform and train when alighting. It’s synonymous with London and you can get souvenirs with mind the gap on them. Alternatively, Transport for London is a great gift, the London Transport Museum will have lots of transport themed things to choose from. Big Ben is under restoration until 2020 so you won’t be able to get the iconic photos with it for some time but you can still buy things with Big Ben on them. Benjamin Pollock’s is a traditional British toy shop located in Covent Garden. It doesn’t sell toys like kids are used today, they are more retro toys like toy theatres and shadow boxes. As an Alice and Wonderland fan I love their shadow boxes, it does require a little putting together but that’s half the fun. Museums will always have gift shops, and while they have predictable souvenirs you can also pick up some other cool things. My favourite is the Wildlife Photographer of the year merchandise as the photos make amazing prints! These are available in the National History Museum. Other museums like The British Museum, as well as the Victoria & Albert Museum, will create limited edition pieces based on their exhibits. London’s craft beer scene is amazing! Not an ideal souvenir if you don’t have much luggage space but if you do make sure to stock up on a few bottles. 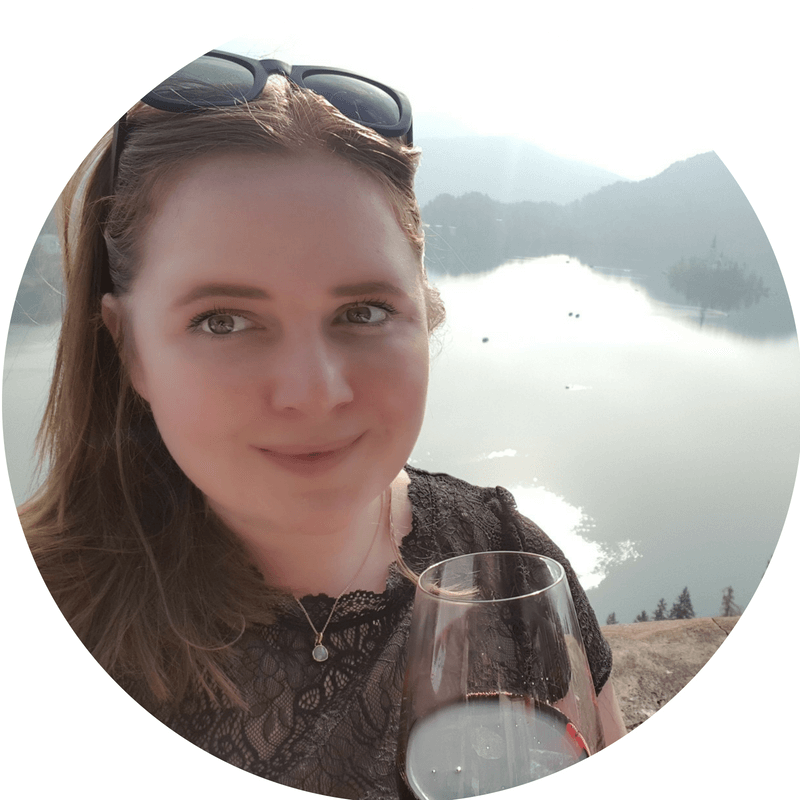 Some of my favourite breweries can be found on the Bermondsey Beer Mile or a few others I recommend are Gipsy Hill, Southey, Beaver Town and Camden. Liberty Department Store opened its doors in 1875 and has become a London institution. Famous for their fashion, interiors and luxury goods as well as their in-house range of fabrics and textiles. Those that love sewing and quilting will be in heaven here! Buy some of their famous fabrics to make a beautiful dress, skirt, top or a lovely memory to a quilt. The Beatles aren’t originally from London but one of their most iconic album covers is taken from Abbey Road which is just in St John’s Wood. Near Baker Street Station you will find the London Beatles Store which will sell everything from postcards to original Beatles tour programmes. Head to the famous Portobello Road Market in Notting Hill to pick up a unique antique glass, cutlery (silverware) or old books. Traders line the streets of Portobello Road every Friday, Saturday and Sunday. Not only can you find antique and vintage bargains but should be added to your list of things to do in London as it’s one of the most well-known markets to visit. 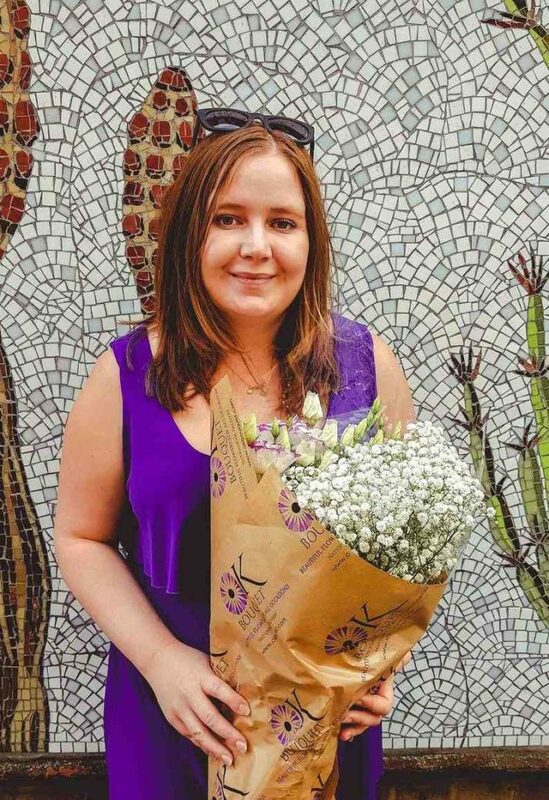 Columbia Road Flower Market is one of my favourite weekend markets, head there on a Sunday and explore the beautiful plants and flowers. Just to get in a bit of history as well the market has been there since the 1800s. Chances are you’re not going to want to take a plant home so the next best thing is bulbs or seeds. When people ask you where your amazing plant is from you’ve got a story to tell them! Check that your country allows you to bring back plant items as some countries like Australia will confiscate these off you. Not scarfs but it is Arsenal Football Stadium! It’s as close as I will get to a souvenir. Why not get a football scarf from some of the most famous teams in the world like Liverpool, Manchester United, Manchester City, Arsenal and Chelsea. You can either visit the merchandise stores likes Arsenal or Chelsea (as they are London based teams) or head to one of the many of the souvenir shops on New Oxford Street or Piccadilly Circus. Penhaligons is a British perfume house and has the cutest little gift sets for both men and women. Perfect for those who like to travel with hand luggage only or on a quick European adventure. Their boutiques in multiple locations across town, if you don’t have time to stop by one of their shops you can buy the fragrances online. Every time I think about hand wash and moisturiser it’s something that my boyfriend’s mum gets me for Christmas but Molton Brown is the super fancy stuff you want in your stocking. They have built a reputation as a luxury bath, body and beauty specialist. You’ll find their products in five-star hotels, as an occasional present or in department stores. There are Molton Brown boutiques all over London if you don’t have time Heathrow T1, T3, and T5 do have a store or you can also buy online. Pimm’s is one of the number one drinks available during summer and you’ll find it on any menu! A Pimm’s Cup is essentially Sprite, strawberries, orange, apple cucumber and mint. There are decadent versions with champagne, prosecco or a touch of spirits. Personally, I prefer soda water instead of Sprite as I struggle with sweetness. Impress your friends at home by buying some Pimm’s and whip up some summery London cocktails when you get home. You can get more flavours of Pimm’s but Pimm’s No 1 is the classic and the one I recommend trying out first. A bottle of Pimm’s can be found at any supermarket or at duty-free. The classic tales of Paddington Bear are iconic to London and a perfect gift for small children. 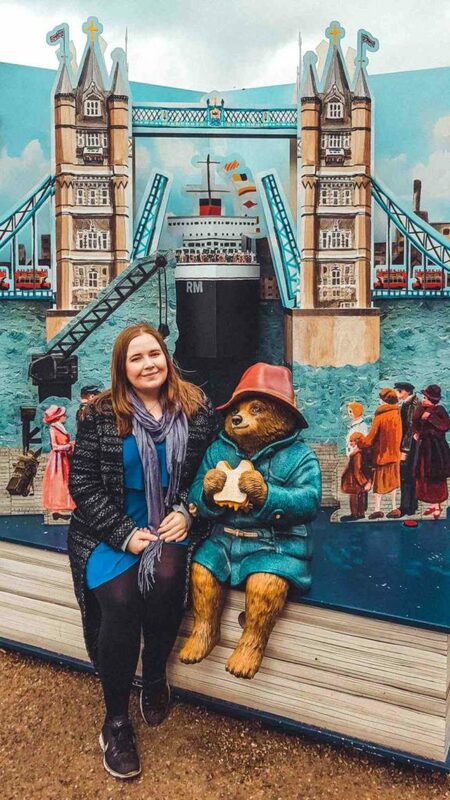 Drop by the Paddington Bear shop at Paddington Station which has stuffed toys as well as other merchandise like key rings, mugs, T-shirts, videos and the famous Paddington books. For a free souvenir head to platform one, where you can pose for a selfie with the bronze Paddington Bear statue under the clock. If you are well versed in the books it’s near to where the loveable Brown family first found him. If you happen to be in London around Christmas, which is totally magical by the way, stop by one of the cute little market stores or a department store and pick up a famous icon. Think Big Ben, the London phonebox, the London Underground, and of course a London bus. Like this cute little set from Not on the High Street. Museums will also sell unique tea sets as another alternative. I absolutely love to fill my house with arts and crafts, I mentioned this in my things to do in Shoreditch video where I’ve picked up some great art work from Backyard Markets. For example, I have picked up some of Alice Tam’s work. She is a UK Artist that does these cute prints and various other things, they are all Birds with Hats. The stalls will change so you aren’t guaranteed to have the same artist at the craft markets. Craft Foxy Markets is another place I love to visit. They move location so check their next location and dates here. To make your buying experience a little easier I have marked up all the stores mentioned above and tried to find an appropriate icon to match! Let me know in the comments below what you bought in London or any other original things you can only buy in London!